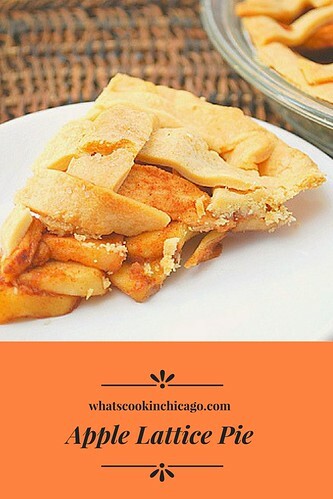 What caught my eye in this recipe was the use of cider vinegar, cream cheese and cake flour for the pie crust. These ingredients aren't exactly what comes to mind when I'm making traditional pie crusts so I just had to try this recipe out. 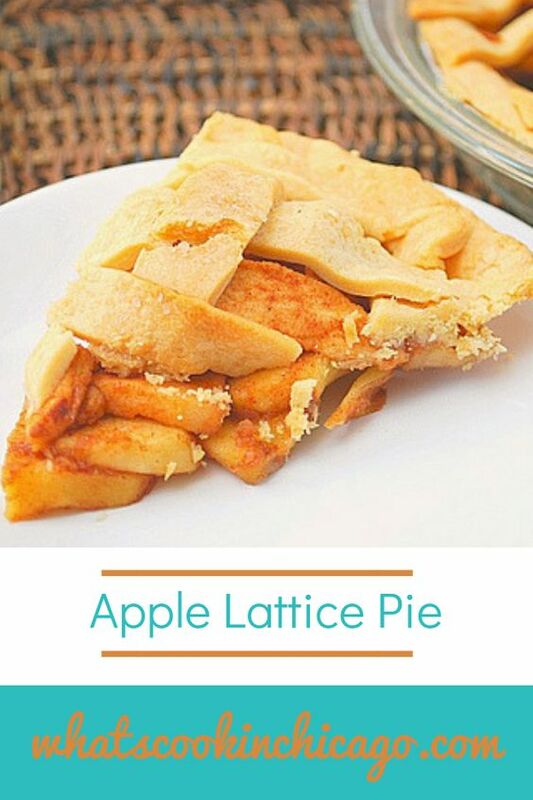 Surprisingly, the use of cake flour made the crust light, the cream cheese kept the crust firm and the cider vinegar was a nice play on the apples and apple cider that was used to make the filling. As for the filling, it called for mace (which is the outer web-like shell of a nutmeg that's been ground to a powder form). I don't use this ingredient often but it certainly adds a unique flavor... almost like nutmeg but with more depth. If you don't want to go out of your way to use mace, feel free to use freshly grated nutmeg instead. I tried both variations and both came out delicious! In a large bowl, stir the all-purpose flour with the cake flour, sugar and salt. Add the cream cheese and use your fingertips to break up the cheese into the mixture until it resembles coarse meal. Cut in the butter with a pastry blender until pea-size clumps form. In a small bowl, mix the ice water with the yolk and cider vinegar. Gradually add the ice water mixture, stirring with a fork. Turn the pastry out onto a lightly floured surface and press it into a 10–inch log. Starting at the far end of the log, use the heel of your hand to quickly smear the pastry away from you, a little bit at a time. Use a pastry scraper to gather up the pastry and repeat the smearing process one more time. Gather the pastry together. Cut off one–third of the pastry and pat each piece into a disk. Wrap each disk in plastic and refrigerate for at least 30 minutes or up to 2 days. In a large bowl, toss the apples with the lemon juice and zest, 3/4 cup sugar, cinnamon, salt and mace. In 2 large skillets, melt the butter. Add the apples and any accumulated juices and spread them in each skillet in a single layer. Cook the apples over moderate heat for 5 minutes, stirring occasionally, until lightly browned in spots. Add 1/4 cup of the apple cider to each skillet, cover and cook, shaking the pans occasionally, until the apples are tender, about 5 minutes. Remove the lids and let the apples cool. If the juices are not thick and syrupy, simmer uncovered for 2 to 3 minutes longer. Let cool completely. On a lightly floured surface, roll out the large pastry disk to a 12-inch round. Ease the pastry into a 9-inch glass pie plate. Trim the overhang to 1/2 inch and refrigerate. Roll out the smaller pastry disk to a rough 12-by-8-inch rectangle; trim the edges. Using a pastry or pizza cutter and a ruler as a guide, cut eight 12-by-1-inch strips. Line a baking sheet with parchment or wax paper. Weave the strips into a lattice on the baking sheet and brush the lattice with water. Sprinkle with sugar and freeze just until firm, about 10 minutes. Preheat the oven to 375°. 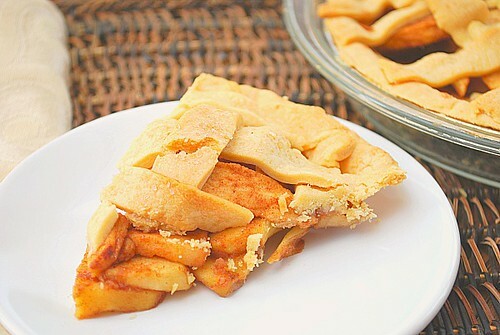 Fill the pie shell with the cooled apples and their juices and flatten them slightly with a spatula. Brush the rim of the pie shell with water and slide the lattice on top. Press the edges together to seal. Trim any overhanging lattice. Fold the rim over onto itself and crimp decoratively. Bake the pie for about 1 hour, until the crust is golden all over and the filling is bubbling. Cover the rim with strips of foil if they become too brown. Transfer the pie to a rack and let cool completely. The cake flour is the #1 ingredient that stands out as unusual. That's so interesting! We have apple turnovers in a cream cheese crust on our site. Wonder how they'd taste with this crust recipe.